Politics brings some unlikely people together. Michael Foot and Denis Healey spring to mind. Or Tony Blair and John Prescott. And it’s not just Leaders and Deputy Leaders of the Labour party. There’s the strange linking of George W Bush and Bill Clinton, total opposites in office, coming together over Haiti. Or republican presidential-wannabe Mike Huckabee reaching out to Liberal film-maker Michael Moore over healthcare reform back in 2007. I’d like to be able to add David Cameron and Nick Clegg to this list but they’re clearly made for each other. Nothing seems even remotely odd about that political coupling after six months in power. Clegg’s as much a Tory as Peel, Disraeli and MacMillan, whatever his protestations. The particular political pairing I’m thinking of today is the one being reported by Labour Uncut. 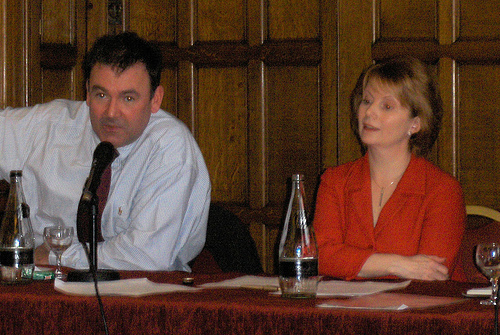 The unholy union of Jon Cruddas, the man who would be chair, and Hazel Blears, the woman who would rock the boat. It seems that Cruddas and Blears have joined forces and formed the ‘Social Action Forum’ to take on David Cameron over his Big Society policy. The forum will be meeting on Wednesday for the first time in Parliament where it will be looking to extend its membership beyond the Parliamentary Labour Party to build a big tent, or maybe a larger-than-average marquee to begin with, of other stakeholders. This is all being done with Ed Miliband’s approval and follows on from his speech at the NPF on Saturday. Jon and I have got far more in common than a lot of people might have thought. We’ve always chatted and talked, but when you come to think about it we come from a similar background. Ordinary families, represent similar working class constituencies, he has a very strong family background, so do I, and were both Labour, Labour, Labour. It will be very interesting to see how this forum develops in the coming weeks and months. Definitely one to watch.